The Active Target Special features several technology upgrades that will satisfy even the most demanding predator hunters. 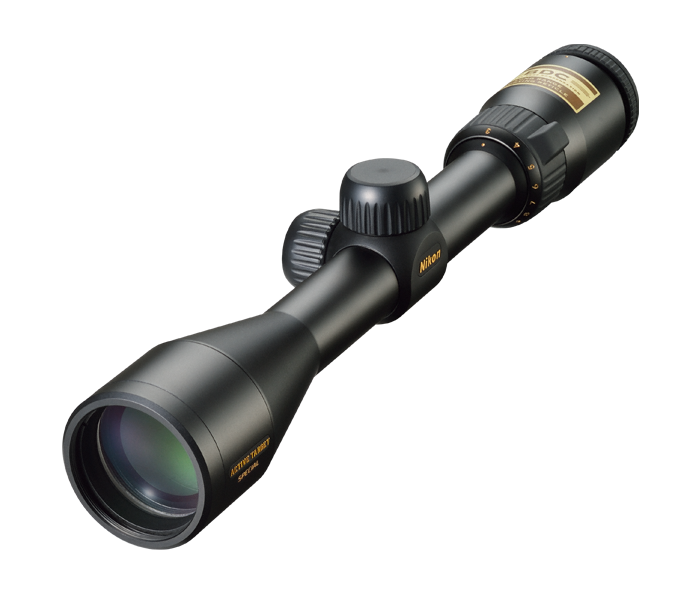 A bright new optical system, remarkable hand-turn reticle adjustments with spring loaded Instant Zero Reset turrets, and a convenient quick-focus eyepiece making adjustments while in a shooting position a breeze. The Active Target 3-9x40 with BDC Predator reticle is an ideal fit for both bolt action and AR rifle platforms and can be used with Nikon Spot On Ballistic Match Technology to take the guesswork out of compensating for bullet drop. With enough power for the longest-range shots and a wide field of view to keep you on predators coming into the call, you can count on the Active Target Special 3-9x40 in any situation. In addition all Active Target riflescopes are built with fully multicoated optics for maximum light transmission, even in extreme low light environments. One defining quality that distinguishes the Active Target from all other Nikon riflescopes is the use of the BDC Active Target Reticle. Designed around the needs of predator hunters, its unique open circle design doesn’t obscure the sight picture and makes shot at moving targets easier. The Active Target is optimized for use with Nikon’s Spot On Ballistic Match Technology to provide shooters with exact aiming points on the BDC Predator Reticle at different yardages and different ammunition. Keeps your brow safe—even with heavy recoiling cartridges, lightweight rifles or severe shooting angles. Reticle adjustments are made in 1/4-inch @ 100 yards click-stop moves you can both feel and hear, and with no backlash to make your shot creep off target. Positive click reticle adjustments get you zeroed in quicker and maintain your setting—even with repeated recoil and under rugged conditions. To simplify field adjustments, Nikon has integrated this feature into all new Active Target riflescopes. Just sight-in as usual, then lift the spring-loaded adjustment knob, rotate to your “zero”, and reengage. Field adjustments are now as simple as dialing-in your subsequent ranges. The Active Target Special series, like all of Nikon’s riflescopes, are optimized for use with Nikon Spot On Ballistic Match Technology. Spot On allows you to discover all of the exact aiming points on your scope’s reticle at various yardages for your specific ammunition and load. Active Target riflescopes feature a removable ARD (Anti-Reflective Device) designed to eliminate game spooking objective lens reflection.